Last year I wrote about our family tradition of Pumpkin Pudding as a childhood staple when Rita, Jorge, and Teresa were growing up. My children did not like carrots and would not eat other yellow veggies so I created this pumpkin pudding for them to get their vitamin A. It was made from canned pumpkin, evaporated milk, unflavored gelatin, sugar, cinnamon, and vanilla. It became quite popular with many family members. For years my younger brother, Jon, received his very own batch of Pumpkin Pudding at Thanksgiving. The recipe was published in The vonRosenberg Family of Texas Cookbook as I mentioned last year in my Pumpkin Pudding post. Teresa’a nutrition related blog is The Dairy Report. And you can follow her on Twitter @TravelingRD. Even more recently I experimented with a new version inspired by Ricki’s various chia based puddings that she creates over at Diet, Dessert and Dogs. This one happened during a clear-out-the-refrigerator frenzy in preparation for Thanksgiving and it was yummy! Whisk or beat ingredients together until smooth. Chill in the refrigerator until set. This is a great for breakfast or as a nourishing snack. Gluten and Dairy-Free French Gourmet Food – Crêpes! 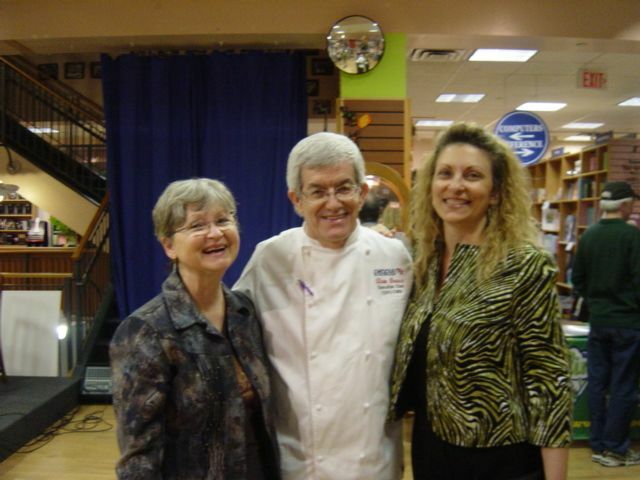 Rita and I have enjoyed our gluten-free French gourmet adventures since meeting Alain Braux. After we had prepared his Brownies a la Farine de Coco for a fund raiser we found out about the book signing event at Book People in Austin. So of course we had to be there. Alain still has a trace of French accent so hearing him speak so knowledgeably about nutrition issues is a double treat. 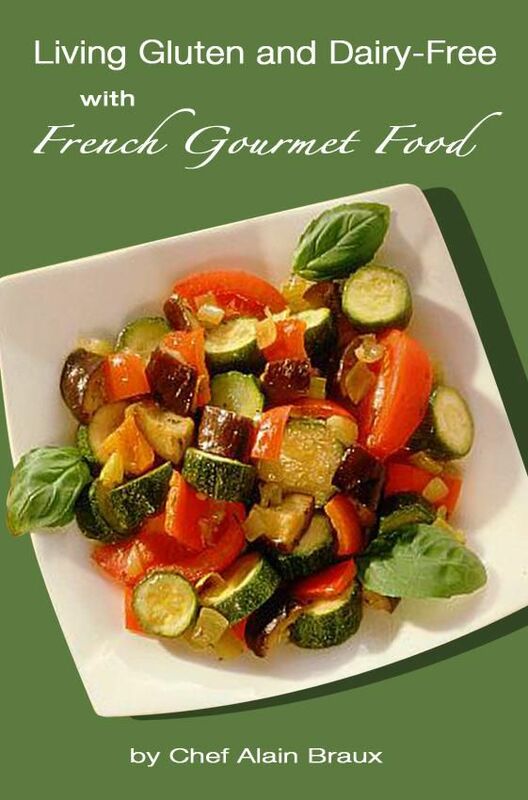 Alain’s first book, How to Lower Your Cholesterol With French Gourmet Food, as well as Living Gluten and Dairy-Free with French Gourmet Food are available at Amazon and both books are downloadable from Kindle. I came home to Georgetown with an autographed copy of Living Gluten and Dairy-Free with French Gourmet Food plus a copy that Alain generously donated to the Georgetown Public Library. Rita and I made arrangements to meet with Alain at the Peoples RX Drug Store location in the Westlake section of Austin where he cooks, consults, and advises people regarding nutrition. The store has an awesome selection of wonderful nutritious food in keeping with the philosophy of food as medicine. The refrigerators contain local sourced fermented foods, name brand staples such as Udi’s, and best of all, Alain prepared treats! I can’t even begin to describe how wonderful is the Flourless Chocolate Cake prepared from perfect organic ingredients. Several of these cakes were baking while we had a tour of Alain’s kitchen domain. I came home with a slice from the deli case to share with Don, who kept repeating, ‘you have the recipe for this’! Yes, it is in the book. I also bought some fresh fermented daikon radish and sauerkraut. While in the midst of preparing for our family Thanksgiving it seems that I was focused entirely on Alain’s exquisite range of baked goods. Now that the holiday is over and going back over the book again to pick out another recipe I find that somehow I skipped completely over the sections on Appetizers, Soups, Salads, Meat and Eggs, Fish and Seafood, Side Dishes, and Desserts! A careful reading of the recipes reveal Alain, the Nutritherapist, at work in the kitchen with the respect he has for the healing power of the ingredients and the care with which they are combined. So then the dilemma: which one to prepare first. There are so many enticing recipes calling my name. However, Don and I had just been talking about pancakes as being a good soft food during his dental surgery recovery and Brittany-Style Savory Crêpes filled with finely minced ham, an over-easy egg and grated cheese might be a good start. And we definitely chose the crepes upon finding all required ingredients were in the house (too often the defining criteria). Don, healing very well, has returned to his usual self-prepared breakfast leaving me obsessed with these savory crêpes! After three batches I have finally started to turn out crêpes that are presentable as well as tasty. It is a matter of getting the batter thin enough and cooking them long enough – they may look done but they are much more flexible and fold nicely when they have cooked a bit longer. 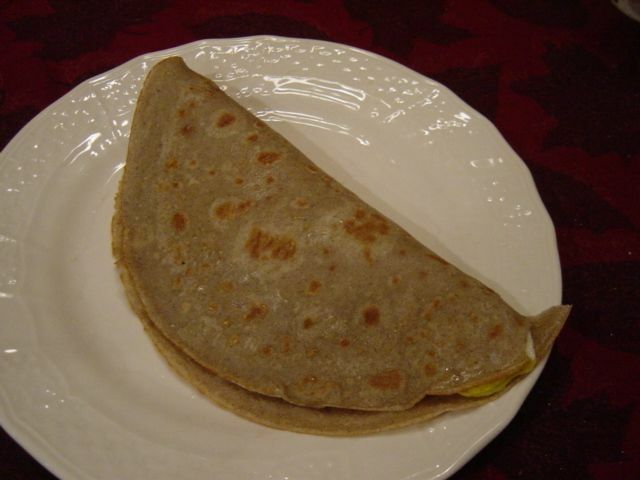 Alain has given us permission to share his recipe for Brittany-Style Savory Crêpes. 1. Weigh your wet ingredients in a large measuring cup or bowl: soy or almond milk, eggs, oil, and mix well together. Weigh your water separately. 2. Weigh the two flours with salt and pepper in your mixer’s bowl. With the whisk attachment, start mixing at low speed. 3. Add the liquid progressively as the machine runs. Adjust the consistency to fairly liquid with the water. Pour into a large ceramic bowl. Let rest covered for at least 1 hour. 4. When ready, heat some olive oil or coconut oil in your frying pan. 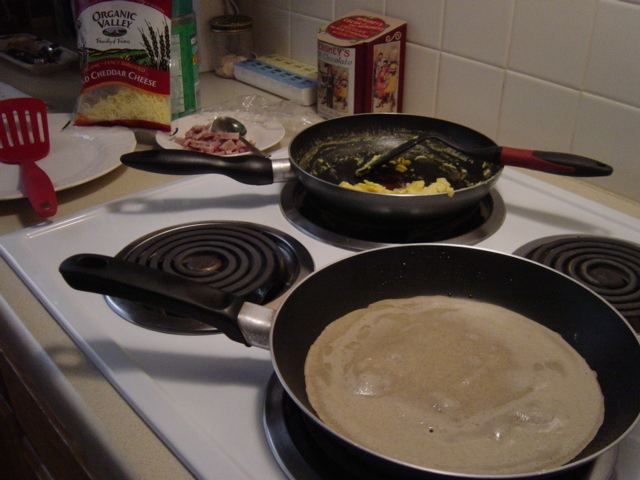 Depending on the size of your pan, pour enough batter to cover the whole pan while whirling the batter around the pan. Cook until the sides turn light brown and start to detach from the sides of the pan. Flip over and finish cooking. Reserve on a hot plate kept warm. Cook all the crepes until your batter is used up. 5. To serve, place a crepe back into the pan on medium heat, place the ham slice at the bottom, then the egg, then the cheese or you can do ham and cheese only, or use ratatouille as a filling and so on. Your culinary imagination is the limit. All over France, you can order your “galettes” with a multitudes of fillings. “La complete” is usually a slice of baked ham, an egg (sunny side up), grated Swiss cheese over it and folded like an envelope. In my region, we like it filled with ratatouille (see recipe in Side Dishes), folded and sprinkled with grated cheese and gratine under a broiler. For Casein-free, replace the cheese with Meat and Egg Dishes (pg 253) Swiss-style cheese alternative (see shopping list) and voila! Professional kitchen equipment is not a requirment. These came out very well with my usual bowl and whisk.